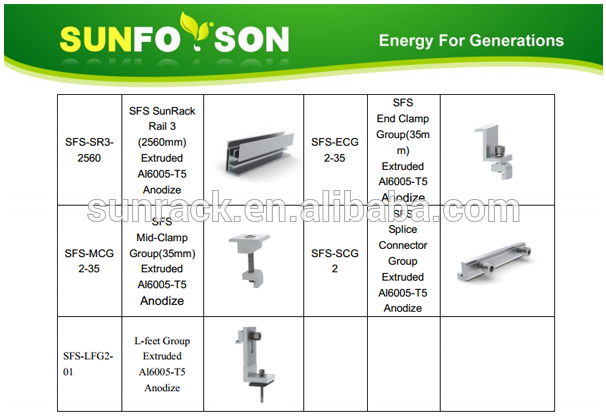 With variety of tin roof mounting clamps，Sunrack tin roof mounting systems can meet different demand of trapezoid，corrugated metal roof and standing seam roof， with and without penetrating on the roof. Sunforson excellent engineering team and quality management system to provide better and better service. Easy Installation: The innovative Sunforson solar rail and G-Screw modules can be installed with a single Hexagon Key and standard tool kit. The G-Screw module and unique rail extension method greatly reduce installation time. High Accuracy: Not need onsite cutting, the use of our unique rail extending allows the system to be installed with millimeter accuracy. Maximum Lifespan: All components are made of good quality extruded aluminum and stainless steel. The high corrosion resistance ensure the maximum possible lifespan and is also completely recyclable. Maximum Lifespan: Sunforson provides a guarantee of 10 years on the durability of all components used.